Why should I choose laser tattoo removal over other methods? There have been many different approaches to tattoo removal over the years, most of which were ineffective, painful and highly likely to leave an unsightly scar. Early methods included such extreme practices as surgery (removal by incision), acid injections, dermabrasion, salabrasion and even skin grafts. These procedures were often extremely painful, required long recovery periods and in most cases, left scars much worse than the original tattoos. During the 1960’s and 1970’s, the Argon and CO2 lasers were developed for medical application and were often used for tattoo removal. Whilst these early lasers did penetrate the dermis to remove the ink, they operated on an ablative basis, leaving damage and scarring to the surrounding tissue. These lasers have long been abandoned for use in tattoo removal. More recently, and since the advent of the internet, there has been a proliferation of dubious advertising for tattoo removal creams, acid peels and the like. None of these methods are capable of penetrating the skin to the depth required for tattoo removal and none of these are dermatologically endorsed. In the last few years there have also been attempts to remove tattoos via the application of chemicals into the tattoo ink. These methods generally involve the use of a tattoo gun or skin drilling device to insert pastes and chemicals back into the dermis, in order to draw the tattoo ink up to the surface of the skin. Such methods rely on scabbing and therefore carry a high propensity to scar. Over the last decade, the development of the Q-switched laser has revolutionised the tattoo removal process. These lasers work on the principle of selective photo-thermolysis, meaning that they selectively target the tattoo ink, without damaging any of the surrounding skin or tissue. Q-switched lasers operate at nano and pico second speeds to shatter the tattoo ink within the dermis, which is then absorbed and removed by the immune system. Due to the speed and precision targeting of these laser pulses, the procedures are almost painless and carry very little likelihood of scarring. At Vanishing Ink, we use the powerful Quanta brand of lasers. These lasers operate at three different wavelengths, allowing us to efficiently remove the full spectrum of tattoo colours across all skin types. The strength and speed of these lasers also ensures a quicker and more comfortable treatment experience, reduced healing time, and greatly reduced chances of scarring. At Vanishing Ink, we pride ourselves on staying abreast of, and investing in, the latest technology, education and training from around the globe. We strongly believe that Quanta lasers are the most advanced and suitable form of technology currently available, for effective, pain free, and scar free tattoo removal. What types of tattoos do you remove? We remove all types of decorative tattoos (both amateur and professional) and some traumatic tattoos. Traumatic tattoos are the result of the implantation of small pieces of debris (such as asphalt or dirt) into the skin during motorcycle accidents, skateboard falls and the like, and are treated in the same manner as decorative tattoos. We also remove the small medical tattoos that are often applied to patients of radiation therapy and we proudly offer this service for free. We do not treat cosmetic tattoos such as eyebrows, eyeliner or lip-liner tattoos. The inks used in such tattoos often contain metallic bases, which react very unpredictably when treated with a laser. In many cases, these inks will actually darken and spread under laser application and may end up looking much worse than the original tattoo. 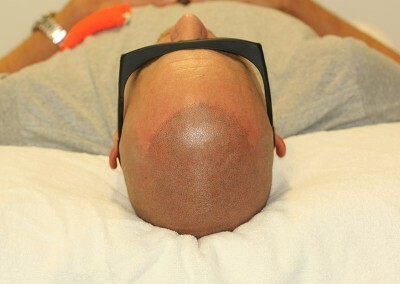 Do you remove scalp micro-pigmentation tattoos? Yes. 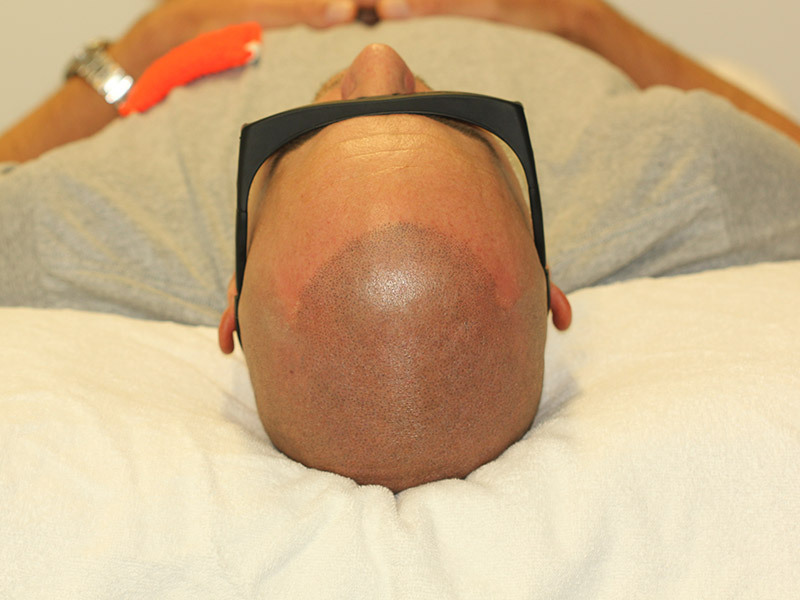 Scalp micro-pigmentation is a relatively new but popular form of placing pigments into the scalp to mimic the appearance of recently shaved natural hair follicles. The procedure is generally very effective and usually lasts 2-4 years before needing to be re-touched. The resulting pigments are tiny shallow tattoos, which can be treated within days of application and are easily removed in one laser treatment. We can remove complete scalp tattoos or even part of a scalp tattoo, in the event that clients wish to simply modify the shape of a hairline. In most cases, 100% tattoo removal is achievable. Our experienced practitioners will assess your tattoo, health, and other relevant characteristics during your initial free consultation and will advise on your likely level of clearance. Please review some examples of our completed tattoo removals in our gallery. In most cases yes. Whilst dark inks such as black, blue and red respond more quickly, all other colours can also be effectively targeted with our multiple wavelength lasers. Importantly, we have a ruby wavelength laser, which is necessary for effectively treating blue and green inks. Some lighter colours such as white or flesh tones may respond more slowly and require a greater number of treatments or in some cases may be impossible to remove fully. In the case of multi-coloured tattoos, it is possible to treat all colours during each visit. Am I a suitable candidate for laser tattoo removal? Are not taking Roaccutane or other medications that will increase your skin’s sensitivity to light. Can I have laser tattoo removal treatments if I’m pregnant? Our advice to pregnant and nursing mothers is to cease treatments or postpone commencement of treatments until the completion of breast-feeding. Whilst there has never been any harm reported to mother or child from continuing laser tattoo removal treatments, we would rather err on the side of caution. All of your bodily systems are already working overtime when you are pregnant, so why add the extra ink removal burden to your immune system. The number of treatments required for tattoo removal is unique to each tattoo and is dependent on a number of variables. In our experience, amateur tattoos generally require between 1 and 3 treatments, whilst professional tattoos can often require between 5 and 10 treatments. During your initial consultation, we will assess your tattoo based on your specific characteristics and will determine the maximum number of treatments likely to be required to achieve your desired result. If you then complete that maximum number of treatments and your tattoo ink is still visible, we will provide free additional laser tattoo removal treatments for a period of up to one year following your last paid treatment. What factors determine how many treatments are required? Whilst all pigment colours can be effectively targeted through the application of suitable laser wavelengths, some lighter colours typically require more treatments than the darker pigments. The depth and concentration of ink placement varies between amateur and professional tattoos and is particularly influential in the case of tattoo cover-ups. Deeper, more concentrated ink, generally equates to more treatments. Sometimes during the application of tattoos or in previous tattoo removal attempts with inferior technology, scarring and other textural changes can occur in the skin. These can cause the tattoo to respond more slowly to laser treatment and necessitate a greater number of treatments. There are thousands of different ink types used across the globe for tattooing, none of which are regulated. Some inks can affect the skin in different ways or may respond differently to laser treatment. Older tattoos can generally be removed with fewer treatments than newer tattoos. Newer tattoos usually require more treatments due to both the quality of the ink and the wider range of colours used. Lighter skin tones generally respond more quickly to laser tattoo removal treatments. Whilst darker skin tones can also be treated, laser power settings will need to be reduced to minimise the likelihood of skin pigmentation changes. Laser tattoo removal is reliant upon the body’s lymphatic and vascular systems for the dispersal and removal of the shattered ink particles. Some parts of the body such as the head, neck and upper torso enjoy better vascular and lymphatic presence than other body parts, and hence respond more quickly to laser treatments. Given that the ink removal process is so reliant on the body’s vascular and lymphatic systems, the healthier you are during the course of laser treatments, the more efficiently the process will work. On top of this, your adherence to the recommended aftercare regime, plays an important role in achieving the desired outcome. In the case of your first consultation, we generally allow 45 minutes to an hour. This gives us time to conduct a thorough tattoo and health assessment, explain the treatment process, and answer any questions you may have. If you then choose to go ahead with our services, we generally also have time to conduct your first treatment and provide a thorough run through of the aftercare instructions. Subsequent treatments are usually much shorter. Whilst the duration of each treatment is dependent on the size and colour of the tattoo, most treatments are completed within 15-30 minutes. In the event that you elect to have a topical anaesthetic applied by us, you would need to allow an extra 90 minutes per treatment, in order to achieve the optimum numbing effect. We strongly recommend that you leave at least 8 weeks between laser treatments on the same site. This spacing is not dependent upon your healing capabilities, but rather, on the time it takes for your immune system to remove the shattered ink particles from the treatment site. If we were to treat your tattoo more frequently than this, we would be re-treating the same ink that your body hasn’t yet had the chance to remove, and you would end up paying more for the same result. As we often say to our clients, “time is your best friend in this process”. The longer you leave it between treatments, the more fade you’re likely to achieve and the fewer the treatments you’re likely to require overall. The chances of scarring are minimal if you adhere to the detailed aftercare instructions that we provide during your consultation. Our leading edge lasers only pulse onto the skin for a few billionths of a second, thereby avoiding the heat build-up and associated scarring that were typical with older style lasers. There is a small chance that you may experience some slight skin tone variation on the treated area, although this is usually transitory and returns to normal within several months after your final treatment. The fact that we routinely use our fractionated YouLaser on all clients after every treatment, means that the chances of any side effects are minimal. Please refer to our gallery for some examples of our scar free results. Can laser tattoo removal treatments cause cancer? No. The lasers used for tattoo removal produce what is called non-ionising radiation, which cannot affect the molecular structure of DNA. These types of lasers have been used to treat various dermatological conditions for over 30 years and to date, there have been no observed increases in the incidence of cancers in this group. Can you remove only part of my tattoo? Yes. We can remove as much or as little of your tattoo as you desire. Our lasers are very accurate and can be targeted to selectively treat ink spots as small as pin heads. In some cases, and depending on your tattoo configuration, we can even remove colours from old tattoos that have been covered up by new tattoos. Can you perform laser tattoo removal on all parts of the body? Yes. We regularly treat tattoos of various sizes on all parts of the body including hands, neck, arms, legs, back, chest, breasts, stomach, buttock, groin, legs, and feet. At Vanishing Ink, you can choose to be treated by either male or female clinicians, in order to reduce any potential unease during the treatment of any discretely placed tattoos. Can I get a new tattoo on the same spot after the removal? Yes. We can either fade your tattoo in order to give you a greater range of colour and design options for a cover-up tattoo, or remove it completely to make space for a brand new design. In either event, it is essential that you allow the treated area to heal completely before commencing the application of the new tattoo. Can you remove a brand new tattoo? Yes. It is possible to treat tattoos that have only recently been applied. However, we strongly recommend that you allow the new tattoo wound to heal completely before commencing laser removal treatment. Depending on the style of the tattoo, the healing time may be anywhere between 3 and 6 months. If you commence laser treatments before your tattoo is sufficiently healed, you will get little result and you will greatly increase your chances of side effects. The only exceptions to these healing time guidelines are scalp micro-pigmentation tattoos, which can be treated almost immediately after application. During laser treatment, we aim to achieve an immediate whitening of the target area, which indicates that the process is working. This frosting is caused by the release of heat energy, created from the action of the ink particles breaking down and usually subsides within 10 minutes. Once the frosting has disappeared, it is not unusual for the skin to develop some redness and swelling, which may last for several hours. This sensation is often likened to the feeling of mild sunburn and can be treated with a covered ice pack and soothing aloe-gel products as required. In some cases, it is also possible that you may experience some minor pinpoint bleeding, blistering or scabbing after the laser treatment. These bodily reactions are quite normal and are helpful in removing the ink from your body. After your treatment, a soothing gel and a sterile dressing will be applied to your treated skin and you will be provided with a detailed set of written aftercare instructions to take home, which will be carefully explained to you. Adherence to these instructions is an integral part of the tattoo removal process and will contribute significantly to achieving the great results that you desire. In many cases, you may start to see differences in the appearance of your tattoo within a number of hours or days, depending on the density and depth of the ink in your tattoo. The majority of the fading occurs over time and will be most noticeable after several months. Avoid excessive heat in the skin (exercise, hot work environments, etc) for at least 24 hours after treatment. Feel free to shower in the first 24 hours of your treatment, but try to minimise the exposure of the treated area to hot water. In the first few days following treatment, apply a cool compress to the area after any showering or exercising, in order to remove any heat that such activities may have introduced. Hot baths, hot tubs and saunas should be avoided for at least one week following treatment. Avoid sun exposure (and artificial tanning beds) at all times during the healing and ongoing treatment process. In the event that protective clothing or other cover is not practicable, apply SPF30+ sun block to the treatment area at all times. You may resume exercise and other activities within 24-48 hours after treatment, but avoid injury to and contact with the treated skin until fully healed. In the event of experiencing any broken skin in the treatment area, you should avoid the application of make-up until the skin is fully healed. Can I have treatments at Vanishing Ink if I’ve been treated elsewhere? Yes. However, depending on the existing state of your tattoo, we may not always be able to offer you a guarantee on the maximum number of treatments. Unfortunately, not all lasers are created equal and prior treatments with an inferior laser can superheat the ink into bigger conglomerates and cause your tattoo to become somewhat laser resistant. Additionally, not all laser operators are created equal and we have seen many examples of clients that have been left scarred by previous removal attempts. Whilst we can usually significantly reduce such scarring with our combined laser approach, the presence of such scarring will likely slow the removal of any residual ink. Why should I choose Vanishing Ink for my treatment? When you choose Vanishing Ink, you are partnering with experts. Tattoo removal is all we do. We pride ourselves on staying abreast of, and investing in, the latest technology, education and training, to ensure that we bring you the highest quality and most advanced treatment options available. We are specialists at ensuring that your safety, comfort and results are delivered in a completely professional and private manner and since opening in 2011, we have performed more than 10,000 tattoo removal treatments on more than 1400 clients. With this degree of experience, you’re in great hands for achieving the very best tattoo removal, modification or fading results possible.